This week is all about paint! Painting with preschoolers is creative, messy, and all about exploration: exploration of techniques, materials, and colors. So grab a smock or strip down to your skivvies and check out all the painting fun! Putti explored Salt Paintings using glue, salt, and foodcolors at Putti Prapancha. She even made a lovely card for her mom! Over at Play Create Explore, this little one enjoyed Berry Painting. A perfect idea for babies and toddlers because the paint is edible! Another toddler painting idea came from An Amazing Child where "J" enjoyed Spray Bottle Painting. 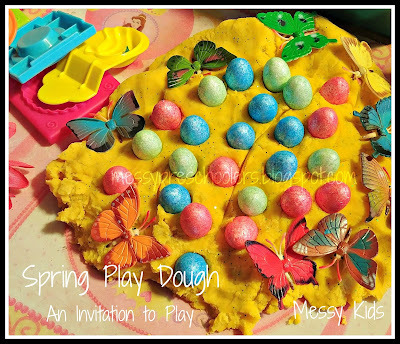 Fantastic, messy fun! Housing a Forest gave Pour Painting a try and the result is simply beautiful! 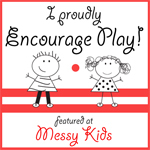 For those featured this week at Messy Kids, don't forget to grab your extra special button! 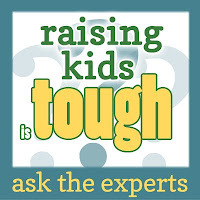 * Give us love and pop a button into your post/blog. 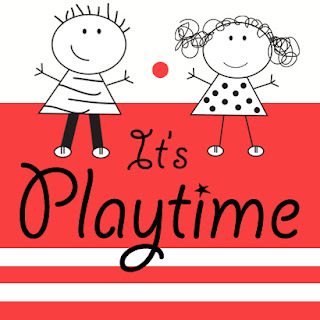 Invite your readers to the weekly playdate! Thanks for the feature. There are so many great ideas. The pour painting looks fantastic. What an exciting process to create such a beautiful masterpiece.